A strong and reliable Information Technology (IT) division is imperative to the success of the University of South Carolina. Input from a broad base of stakeholders is necessary to ensure IT services support the academic and research goals of the university. Several groups, made up of thought and opinion leaders from across the system, have been established to provide direct input in IT strategies and initiatives. The IT Executive Board provides oversight of major projects, service improvements, and infrastructure investments. Committee members make recommendations about university-wide IT strategies, investments, projects and initiatives. 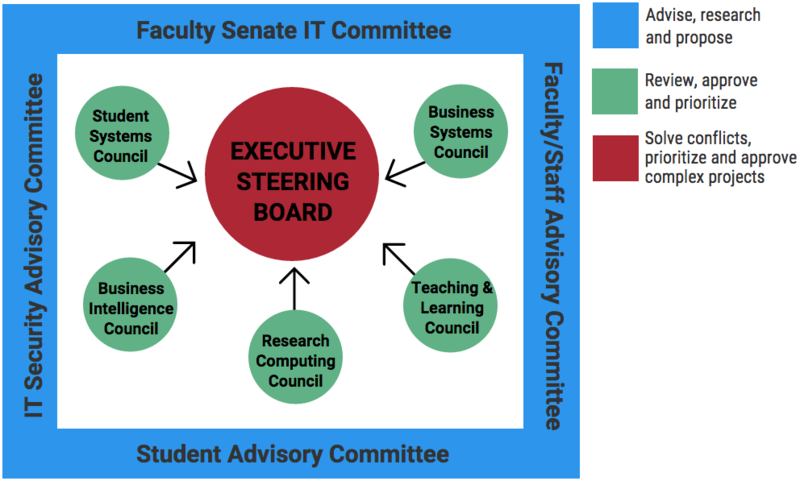 Committee members ensure consistent progress toward a mature IT governance model at UofSC. The Vice President of Information Technology and Chief Information Officer serves as chair of the committee. Membership is reviewed every two years by the Provost and Chief Operating Officer and adjusted as needed. The Faculty and Staff IT Advisory Committee consists of approximately 30 cross-representative thought and opinion leaders that work together to make sure all stakeholders’ interests and needs are considered. The group meets four times per year to discuss and prioritize IT topics for further exploration. Committee members identify IT initiatives that will benefit the education and research goals of the university. Topics on which to focus are selected by vote of the entire committee. Small, ad‐hoc teams are assigned to each topic. These teams take approximately 6-8 weeks to research topics, identify benefits of implementation, uncover potential restraints, and submit a formal report to the entire committee. After reviewing the reports of subcommittees, the committee may approve initiatives for implementation. The Chief Information Officer and Division of Information Technology will then take ownership of implementation. All reports of subcommittees will be listed on this page. If you are interested in joining the group for the 2019-20 academic year, we would love your involvement. Please email Michelle Foster at mfoster@mailbox.sc.edu. Click on a report to see the list of individuals who worked on the topic. The Identity and Access Management (IAM) Advisory Committee advises the DoIT on establishing priorities and procedures regarding the products, applications, and platforms that manage the identity of users and their access to university systems. The committee is composed of faculty, students, and staff representing areas across the university system who are knowledgeable in their respective fields of expertise. Meetings are held quarterly and members serve two-year, renewable terms. Appointments are for two-year renewable terms. The IT Security Advisory Committee includes approximately 20 members from academic and administrative areas, with a mix of both faculty and staff. The group provides advice to the Chief Information Security Officer regarding information security and how to best achieve the goals of the Information Security Program. It also promotes visibility of information security across the system. The Student Advisory Committee is an officially chartered group of the Student Government Association. Comprised of 10-15 members representing a variety of disciplines and majors, the group meets with the Vice President for Information Technology four times per academic year. The committee allows central IT to share developments and updates, and gain valuable input. Students are also encouraged to share ideas and ask questions about IT initiatives. The students are then charged with sharing information they learn with their peer groups. The Student Systems Council is a voting, decision-making body made up of representatives that work directly with students. The Council is responsible for the review and approval of projects and enhancements related to student systems such as Banner and my.sc.edu. The group prioritizes projects across units and resolves conflicts between competing projects. They approve the Student Systems roadmap and recommend technology-related university policies to the Executive Steering Board. The Technical Review Board (TRB) consists of technology leaders in the eight-campus system who work together to develop enterprise technology standards and encourage their adoption with the overall goal of reducing technology duplication and operational costs. The TRB meets virtually to review new proposed IT initiatives and make recommendations to the CIO. The Research Computing Advisory Committee provides input and guidance related to activities that enhance the research mission of the university, investments for Research Computing (RC) technology and the prioritization and monitoring of RC usage policies and procedures. Members of the committee represent the research community across the university system and help set the direction for future RC initiatives or projects. There are three types of governance groups: advisory committees, councils, and boards. Advisory groups are non-voting groups that meet to brainstorm ideas and offer suggestions and input on IT projects. Councils have voting rights and responsibility for resource allocation. The Executive Steering Board is comprised of university officials and not only has voting rights, but final authority on decisions. The model below illustrates the overall governace process in the Division of Information Technology. Some groups illustrated have not yet been established.